Young adults are searching for a Church that demands their best. Whether it is in mission, worship, theology, or daily life, they want a Church that is relevant not because it tries to tell them only what they want to hear, but because it offers them a vision of the Holy and its transforming power. A Church that reaches for and preaches relevance is a Church that makes itself irrelevant. The quest for relevance is the mark of quiescent extinction. Questing for relevance, as if it is a goal worth achieving in and of itself, is a sad and tired pursuit. It is not relevance that defines a people or that marks transformational leadership, but authenticity, passion and purpose. It is passion for God that shines through and marks a Church as Holy, as set aside for Gods use, and as deeply and overwhelmingly relevant. There is a profound difference between a Church that is “relevant” and a Church that matters. We are relevant only insofar as we offer a way for our believers to have their lives formed to the pattern of Christ’s own life. We are relevant only insofar as we offer cruciform living and it is only in offering that transformation that we matter. Young people are not looking for the easy path in life. They don’t mind a challenge – it is too often us who fear the challenge. They are not looking for the path of least resistance. Look at the number of young people participating in the Occupy Movement across the country or those joining Teach for America, the Peace Corps, the Episcopal Service Corps, Jesuit Volunteer Corps, Americorps, Lutheran Volunteer Corps, and the countless other service programs that call young people to live sacrificial lives in the service of others. These young people are not trying to find an easy path – they are trying to find a path that makes a difference both to themselves and to others. The Church must honor that deep desire by offering more – by offering them all that we have ever had to offer – the life-changing encounter with Christ. Young people are searching for a way of being that is honest and rooted in something greater than themselves; the Church has been too timid about offering that. We can do so with joy, for we are part of a Church that has a way of being the Body together that honors individual gifts while also calling us to a higher common identity. The only thing the Church has to offer and has ever had to offer is the worship of God who calls us to relationship. That worship is the heart of evangelism. It is the pulse of outreach. It is the essence of the history and future of the Church. I am not talking of worship in the ritual sense – though that is vital too. I am speaking of something deeper, the turning of the heart toward God. This is what the Church is called to – turn its heart, the heart of its believers, and the heart of the world around us toward God. It is the genuflection of the heart in awe. The next generation of church leaders is ideally prepared to bring the Church forward. They understand the complexity of human nature and society. They value honesty and real relationships (despite how we might disparage the falsity of Facebook and the like). They have a healthy approach to life that finds identity more in relationships than career. They have seen both the challenges of fundamentalist religion and the costs, especially to families, of a society without grounding. They are always searching for the real amidst hyper-marketing. They are generally optimistic and not saddled with cynicism or with a reflexive distrust of (and desire to deconstruct) everything. They are trying to figure out how to put the pieces back together again. In other words, they are prepared to lead a Church that is grounded, honest, thoughtful, optimistic, complex, and engaged. For those despairing for the future of the Church, I can honestly say that we have a generation of leaders coming who will make all of us very proud. However, we have to have the courage to pass on to them a Church that knows who and what it is. We will be deeply blessed as our leadership becomes increasingly inter-generational. Do you believe there is a difference between a church that is relevant and a church that matters? 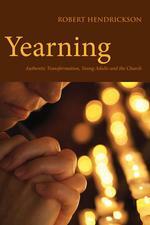 Robert Hendrickson is the Sub-Dean of St. John’s Cathedral in Denver, Colorado and the author of Yearning: Authentic Transformation, Young Adults, and the Church (Morehouse Publishing, 2013), a book that explores the passion, spirituality, and commitment in young adults in the Church today. This article is an excerpt from the book.